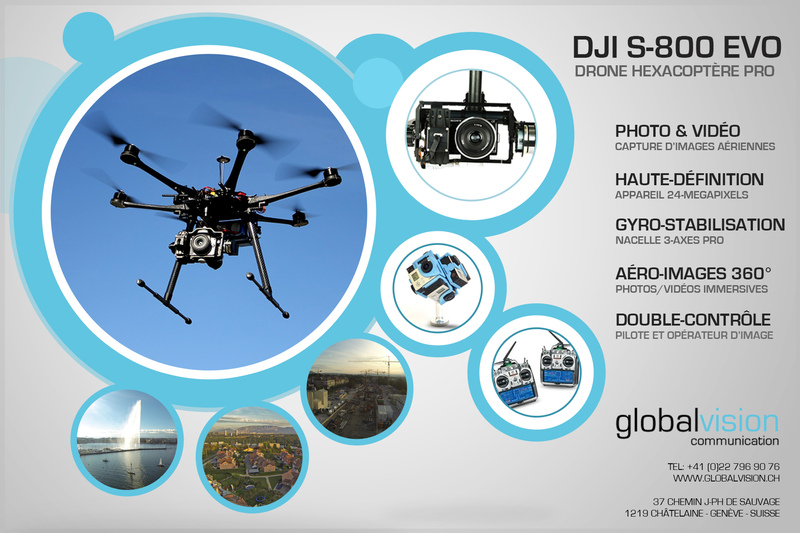 globalvision recently aquired a second drone for the capture of aerial photos and videos in Geneva and in Swiss Romande. The S800 EVO drone is the latest born of the DJI professional drones. The camera is stabilized with a Zenmuse Z15 nacelle. Our client are sure to obtain smooth and high quality images. globalvision realizes aerial images in high quality for demanding clients. Therefore, we offer a large range of material which allows unequlled aerial images (photos and videos) and 360° services (images and ommersives videos). globalvision is proud to constantly innovate and to offers a unique material in Swiss Romande. We offer standards in captation so the professional form tourism, real estate, television or cinema can ask for our services for the realization of their aerial contents. We are present in the whole production chain, from the aerial images captation to the post production and animations. globalvision assures to you and your projects a full success.